Some writers on the Internet have noticed that PF, since his masterly handling of reporters' questions in the Airliner after Viganogate, has been rather preoccupied with Biblical allusions to Silence. Much tut-tutting has been expressed by some of these rather censorious writers, who feel that PF has been rather bold in comparing himself to the Lord who was led out in Silence like a lamb to be sacrificed. Others have sarcastically alluded to the contrast beteen his recent stratospheric taciturnity and the endless loquacity which particularly characterised the first carefree years of his pontificate. Personally, I wondered if he was going into training before retiring to Mount Athos to immerse himself in the Hesychia of the Palamite monastic tradition (don't forget you read it here first). But, this last Sunday (XVI post Pentecosten), PF has missed a fine opportunity to add to his growing collection of Biblical proof-texts about the aureity of Silence. If, as I daringly surmise, PF celebrated he Novus Ordo rather than the Mass of Ages, he missed the opportunity of reading (as the rest of us did in the EF) and preaching upon a passage in S Luke Chapter 14. It includes verses 2-6, in which the Lord addressed a question (or, as we might say nowadays, posed a dubium) to the nomikoi kai Pharisaioi (Torah-experts and Pharisees) about whether it is lawful to heal on the Sabbath or not. Hoi de hesychasan (But they kept silent)! How very, how exactly like the new and evasive PF!! They were not going to run the risk of answering questions which might expose them! They weren't born yesterday! You don't get to where they got to by answering tricky questions! 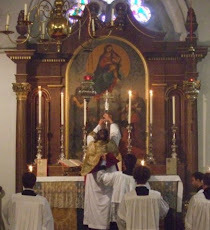 I know what some of you are saying: "Here is Fr H sneering yet again at the Novus Ordo. As mandated by Sacrosanctum Concilium of Vatican II, a much broader set of Biblical readings is now available for the edification of the Faithful. The next liturgical Year is C in the cycle, which means that we shall soon be getting a real ear-full of S Luke for an entire year, doubtlessly including those five particular verses which H is so keen on. I'll prove it ... just hang on while I flip through the Sundays per Annum ... here we are ... Year C ... look at that! ... 22nd Sunday per Annum ... there you are ... Luke Chapter 14 ... here it is ... Oh dear, here it isn't ... the Gospel reading seems to skip from verse 1 straight to verse 7 ... er ..."
These sorts of lectionary details can be checked in about 12.5 seconds by using the immensely handy Index Lectionum by Matthew P Hazell. Everybody should possess one! I see the world is ROTTEN because of SILENCE." A worthwhile activity for we Latins when it comes to The Lil' Licit Liturgy is to try and imagine an E.O Priest obeying if he was told he could not celebrate the Divine Liturgy of St. John Chrysostom but had to use some revolutionary rite for that is an activity that just may trigger thoughts such as- Gee, you know, maybe we Latins are a tad too legalistic and not even one percent of the authentic traditionalists we imagine own selves to be. For today in the EF (Sts. Protus and Hyacinth) we get Luke 12: 1-8, which includes "For there is nothing covered that shall not be revealed: nor hidden that shall not be known. For whatsoever things you have spoken in darkness shall be published in the light: and what you have spoken in the ear in the chambers shall be preached on the housetops." But alas, according to our handy Hazell, this reading also never occurs in the 'expanded' readings of the OF! ABS: please forgive me for being arrogantly pedantic, but one does not say "A worthwhile activity for we..." but "for us". The fact that you add "Latins" does not change the fact that the preposition "for" takes after it the oblique case "me/us". Ditto, for example, with "to", etc.. CORRECT: "Christ died for me a sinner"
INCORRECT: "Christ died for I a sinner"
CORRECT: "He was very kind to me, an outsider"
INCORRECT: "He was very kind to I an outsider"
Father, may I ask your opinion on the text of the present English version of the Roman Missal, with special attention to the Grail Psalms and the Jerusalem Bible? I refer not merely to the translation's correctness nor the grammatical quality of the texts, but rather to the suitability of either every-day or sacral language in the liturgy of the Church and the worship of God. I always feel that when we do use the vernacular, as, indeed, is usual in the Novus Ordo, the quality of that language with which the priest and faithful address God should also inspire and edify us by its elegance and beauty rather than banality. Dear Father. Because ABS specialises in error, he is accustomed to correction and so he has no cause to forgive you for your correction. In fact, ABS can now credibly claim he has been corrected by a cleric of substantial quality and so he thanks you. It is prolly because he has always written with his ear rather than with an eye to grammar that ABS has been the subject of prior correction and so even though we Latins may set on edge the teeth of grammarians, it does "sound" better to ABS than us Latins. Dear Father, thank you for the grammar lesson. It is most disheartening to hear people with doctoral degrees say "He invited Susie and I to dinner." The conjunctive seems to throw them, as the speaker would never say "He invited I to dinner." At that point I have to wonder about the speaker's ability to think. Since the teaching of English grammar has apparently gone the way of quill pens, the only solution is compulsory Latin and Greek, leading to trickle down consciousness of grammar in the spoken vernacular. I hope you will agree. Matthew P Hazell's Index Lectionum is simply excellent. That and Lauren Pistras' Collects of the Roman Missal (shows where not just the Lectionary but nearly all the Gelesian and other ancient collects had anything too penitential filleted out) have given me a decent comparative understanding of the Mass of Ages and Novus Ordo Missae. I cannot see how the latter can be seen as remotely as nourishing to the spirit as the Mass of our ancestors. On the other hand there must be many important passages of Scripture people need to hear which they will hear in the NO Mass and not in the OF. It would be good to see OF devotees acknowledging that. F1 called it right by staying silent. It's not his fault that he doesn't understand the American culture wars as none of his predecessors did either. Father Spadero was dispatched to gain an understanding and came back totally confused. On the Lectionary issue, I did an analysis some years ago of the Gospel passages that are not read during the three-year cycle, and in this post (http://ccfather.blogspot.com/2013/05/the-unread-gospels.html) I summarise the themes that seem to me to have been de-selected... The post also contains links to the previous posts in which the substantial work (ie analysis Gospel by Gospel of what has been omitted) is laid out.